We are working hard under the guidance of DR. Sanjiv . K Jha founder and Director of C.C.D.R. Visiting Professor to many university across the globe. 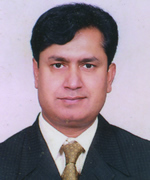 Sanjiv jha gained his undergraduate qualification in physiotherapy from NIRTAR cuttack in 1994. He did his masters from G.N.D U AMRITSAR . He got certifications from Curtin University Austrailia, Orthopedic Medicine International (Belgium), McKenzie Institute (USA), He has organized and taught in more than 100 wokshops ,cmes and conferences in manual and sports physiotherapy, including the 1st World Congress on spine care.. He has presented several research papers at various Conferences And guided many research projects. He has treated more than thousand cases and taught more than 2500 physiotherapist all across India. These courses are well received by physiotherapists who have a wide range of backgrounds and manual therapy experience. He is nationally and internationally recognized as an expert in the field of physical therapy , and a great entrepreneur from whom we drive our inspiration .